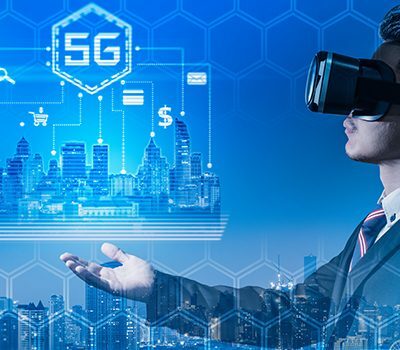 Two key features in 5G New Radio (5G NR) are especially important for the realization of higher data rates than in LTE: the use of millimeter wave (mmWave) frequencies (up to 100 GHz) and support for significantly higher signal bandwidths. 5G NR supports signal bandwidths up to 100 MHz for carrier frequencies below 6 GHz, and up to 400 MHz for frequencies in the mmWave range. Similar to LTE, 5G NR employs orthogonal frequency division multiplexing (OFDM)-based waveforms in both the uplink and downlink to utilize the wide carrier bandwidths efficiently; however, it allows more flexibility in subcarrier spacing for deployment in different frequency bands. It is expected that up to 16 carriers can be aggregated, making it possible to offer bandwidths in the gigahertz range to a single device. 5G NR also employs massive MIMO and beamforming techniques that rely on massive antenna arrays to combat the effects of higher attenuation at higher frequencies. For the cellular industry, the spectrum above 6 GHz is a new area, and component developers are facing many challenges such as higher path attenuation, frequency response and phase noise as well as linearity and efficiency aspects. The circuitry needed to generate frequencies in the mmWave range requires careful design and selection of components in order to reduce the effects of phase noise introduced by mixers and multipliers. These high frequencies intensify the challenges for test and measurement (T&M) methods. The short wavelengths and higher losses in circuits necessitate tight integration, making it impractical to supply connector ports for testing. At the same time, the effects of connectors and test fixtures become non-negligible, potentially affecting the validity of conducted measurements. 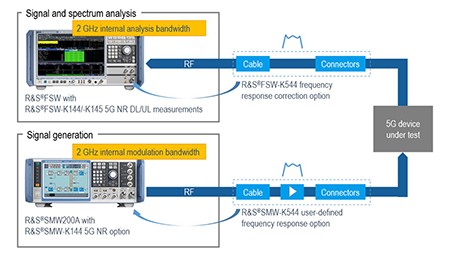 Up-to-date test and measurement equipment from Rohde & Schwarz can help the industry quickly bring 5G NR solutions to market. developers need flexible T&M solutions to generate and analyze such 5G wideband signals in order to develop and optimize their designs. A signal generator for 5G NR needs to be able to generate extremely clean wideband signals with excellent EVM over a wide frequency range. This requires the signal generator to exhibit outstanding spectral, phase and amplitude characteristics. To overcome high path loss at mmWave frequencies, very high RF output power is also necessary. Additionally, signal analysis bandwidths of at least 1 GHz become necessary in order to capture the interaction of multiple component carriers. Learn more about 5G NR in this 5G New Radio Technology Introduction video. Learn about 5G and the LTE evolution with this Infographic. Fill out the form below if you have questions about Rohde & Schwarz OTA test solutions.